Looking for an easy to install, adjustable bolt on hinge set that won't let your gate sag? Our bolt-on adjustable hinge for round posts, are strong, simple to install, safe for livestock, long lasting, and will never sag! 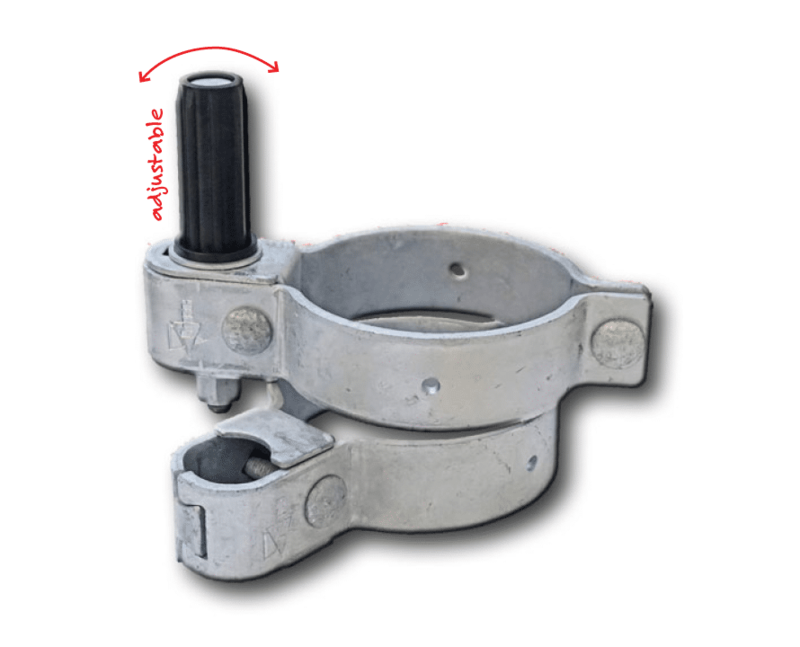 This patent protected heavy duty hinge set (also known as the FG6), is specially made for swinging rural gates on round steel pipe. Rotech built this hinge set to make it easy for farmers to fit gates to pipe and keep their gates hanging level, and out of the dirt. It sound simple, doesn’t it? Yet, there are thousands of gates that are still dragging in the dirt, or sticking way up in the air. Why? Because they are not adjustable. The FG6 allows you to adjust your gates angle over time, so you will always have a smooth swinging and stable gate. The hinge will support the gate in any position throughout swing a full 180 degrees without twisting due to its unique “CUBELOK” Gudgeon pin assembly. To add even more rigidity, when supporting extra-long or heavy gates, the hinge straps contain predrilled holes that can be utilised to fix the hinge straps to the posts with screws. The Gudgeon pin on the Rotech FG6 is a full 75mm long and is fitted with a heavy duty Nylon bush.This ensures the base of the gate is held securely, and swings effortlessly. Once the gal coating is worn away, the affected surfaces of both the gate and pin form rust. This in turn creates friction, grinding away the metal surfaces and making your gate hard to open and placing far more pressure on your hinge. The real secret to the strength of the Rotech FG6 is the patented “CUBE LOK” gudgeon pin mounting assembly. This unique innovation allows the gudgeon pin to be adjusted away from the post but supports it in such a way that it is bolted in place both horizontally and vertically, making it the strongest adjustable pin on the market. To add extra strength we include a long nut on the bottom of the hinge assembly, giving our adjustable hinge set twice the holding power of an adjustable hinge with a standard nut. This added strength mean your nut won't slip over time (which is a problem with other gate hinges). Rotech's FG6 means no more sagging gates. What's best is they require no welding or grinding! That means they are perfect for summer - no fire risk! It is no wonder government departments and mines love this gate kit! Don’t risk a cheaper alternative. Don’t get talked into fitting Non-Adjustable bolt ons. There is nothing truly like the Rotech FG6! The bottom gudgeon pin on this bolt-on round post gate kit allows you to adjust the gate angle easily, whenever its required. No more gates dragging on the ground, or sticking up in the air. Now, you can get the swing just right. The FG6 can be installed in minutes, with no welding or drilling. All you need is a shifter. Because this is a bolt-on gate kit, it can be taken off, adjusted, turned around, etc at any time, easily. WARNING: No adjustment = Sagging gates. Don’t waste your time and money on non-adjustable bolt on hinges. Rotech’s adjustable bottom gudgeon pin allows you to adjust the gate angle easily, whenever it's required. 4 post straps (2 x 2 halves). Adjustable gudgeon pin and bracket. There are tens of thousands of FG6's scattered around the country, all doing one thing really well. Smoothly swinging gates. They do this effortlessly, thanks to their design and the 20% extra strength they have over alternative kits.